Canada has won the 2018 World Juniors in Buffalo, New York after Tyler Steenbergen scored with time running out, giving Canada the 3-1 win over Sweden. The game was by far the most intense, crazy game of the tournament, with both teams getting tremendous scoring opportunities. Canada thought they scored early in the first when Dillon Dube knocked the puck past Filip Gustavsson on the scramble, but the whistle had gone just in the nick of time for Sweden for the goal to be disallowed. But Dube didn’t mind, scoring a goal early in the second to end Gustavsson’s shutout and give Canada the lead. At 1:49 in the second, Dube broke the ice after Jordan Kyrou made a pass past top draft prospect Rasmus Dahlin in the slot. Dube would then use the extra room to beat out Timothy Liljegren, who was applying some physical pressure, before sending it over Gustavsson in close, giving the team north of the border the advantage. Sweden was the more aggressive team with the puck, and after scoring twice shorthanded against the Americans, they made it clear they weren’t to be messed with when it comes to special teams. Tim Soderlund would add to Sweden’s great tournament when he broke in on a rush and beat Carter Hart glove side, using a Canadian defenceman as a pick to create a bit of distraction on the way in. Coming into the game, Tyler Steenbergen was the only Canadian forward to not score at some point. With 32 seconds played in the opening period, it didn’t look like he’d get the chance to change that. But with 1:40 left in the game, Steenbergen scored from the slot to score the biggest goal of his career, putting Canada up by one with time running out. Alex Formenton would score one more before the game was over on the empty net, securing the gold medal in front of nearly 18,000 people at the KeyBank Center in Buffalo. 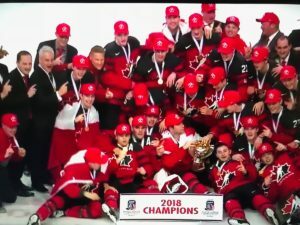 With the win, Canada has taken gold for the first time since 2015 back in Toronto, while also taking their fourth gold in six tries in the United States, including the 2005 tournament with players like Patrice Bergeron and Sidney Crosby. Sweden has yet to beat Canada in five gold medal games, which includes back to back championships for Canada in 2008 and 2009. 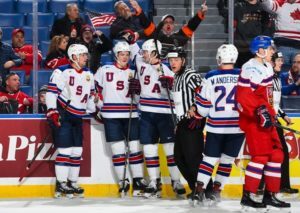 The United States have won the bronze medal at the 2018 World Juniors in Buffalo after stomping the Czech Republic 9-3 on Friday evening. The Czechs simply did not have much steam in the game, showing signs of struggles ever since their victory against Finland on Tuesday to place them in the medal round. They failed to record a shot until the 12th minute of the game and recorded just three in a 13 minute span that found its way through two periods. The Americans, however, didn’t want to leave the tournament empty-handed. With just three seconds left in the game, Trent Frederic scored on a rush after beating out Martin Kaut to the puck, firing it past Josef Korenar to make it 1-0 heading into the second. The game fell apart quickly for the Czech Republic after that, with USA taking the 5-0 lead into the halfway point in the game. Just nine seconds into the middle stanza, the shot after Frederic’s, Ryan Poehling got his first of two goals after Joey Anderson set him up for the rush down the ice. Poehling took a perfect shot that beat Korenar high, putting the Americans up by two. Four minutes later, America’s leader made it 3-0. Anderson would get one of his own after tipping in Brady Tkachuk’s shot with his foot, chasing Korenar from the net in favour of Jakub Skarek. Frederic, a Boston Bruins prospect who had an up and down tournament on the US fourth line, finished the tournament with his best game of the event. He would score two more goals, including the 6-0 goal that USA held for much of the second. Not many fans took part in the typical hat-throwing exercise, with just four hats landing on the ice following the goal. Between Frederic’s two goals was Kieffer Bellows’ second penalty shot goal of the tournament. The goal put him among American greats after tying Jeremy Roenick for the most goals by an American in a single tournament with eight. Before the final minute would begin, however, Bellows would score one more goal, putting him in sole possession of first, and just two behind Roenick for most goals in World Junior history by an American. The Czech Republic would get two reasons to cheer early in the third, but it didn’t matter much in the final result. Martin Kaut would score 43 seconds into the third on the power play after tipping in Libor Hajek’s shot, only to have Radovan Pavlik put one more past Jake Oettinger to make it 7-2. Frederic would score his fourth goal game and Patrick Harper would get one late, while Daniel Kurovsky would get the Czechs to smile once more, but the United States would hold on for the 9-3 victory to win the bronze medal. The win would give the Americans their sixth bronze medal and third medal in a row, giving them the longest streak after knocking off Russia before they could take their eighth. It would also be their second medal on home soil in six attempts, both being of the bronze variety. The Czechs could still hang their heads high with the loss, as it was still their best placement since the 2005 World Juniors. The Czechs can bring back 11 players next year, including many of their players like Jakub Galvas and Filip Zadina. 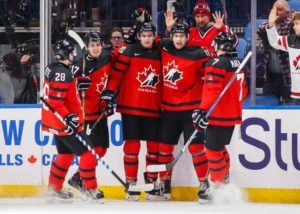 Canada is off to the gold medal game at the 2018 World Juniors thanks to a monstrous 7-2 victory over the Czech Republic on Thursday evening in Buffalo. The first period was very intense, with both teams trading quality scoring chances at a higher rate than the two previous games at KeyBank on Monday. 5:55 in the first, the Czechs took the surprise 1-0 lead after Martin Necas fed Filip Zadina in front. Zadina, a potential top five pick at the NHL Draft this year, scored on a beautiful wrist shot goal after sending it over Carter Hart’s glove, putting the Czechs up by one early. But Canada wouldn’t leave the first period without a pair of goals. At 15:05 on the power play, Cale Clague set up Sam Steel to the left of the Czech net, who fired a one-timer past Josef Korenar to make it 1-1. Three minutes later, on Canada’s next man advantage, Drake Batheron would tip in Cale Makar’s point shot to put Canada up in front in a game where they were dominating puck battles early on. Batherson would come alive in the second, scoring his sixth and seventh goals of the tournament to complete the hat-trick. At 27:48 on the power play, Batherson made Radim Salda pay for taking a penalty when he sent in a shot off of a Makar feed past Korenar, putting up Canada by two. After Maxime Comtois and Jordan Kyrou both scored after the halfway point in the game, Batherson, Canada’s fourth line winger, would complete the hat-trick after taking the puck off of Michael McLeod and skating in, beating Korenar blocker side to cap off one of the biggest periods of his career and to give Canada the 6-1 lead. Canada wasn’t done. At 5:17 in the third, Boris Katchouk scored after taking Robert Thomas’ pass and making new Czech netminder Jakub Skarek look silly with a great shot, giving Canada the 7-1 lead. Zadina would score one more goal to give him seven in the tournament before the game was over, but Canada did enough damage early on to give Canada the victory to advance. For the third time in four years, Canada will look for the gold medal at the World Juniors when they take on Sweden at 8:00 PM. Canada has won gold in three tournaments in the United States, but they did lose the last time it was in Buffalo back in 2011 to Russia. Still, with 16 goals in two games in the playoff round, Canada looks strong against Sweden, a team that has never beaten Canada in the final game. The Czech Republic are guaranteed to have their best finish since 2005 when the team last won bronze. Since then, the Czechs have failed to medal, with their last gold medal dating back to 2000. They’ll face the United States at 4:00 PM, with the Americans looking to grab a medal on home ice after a championship in Montreal last year. Sweden will play in the 2018 World Junior finals after a strong 4-2 victory over the United States on Thursday. The first half of the contest was mostly defensive, with the teams combining for just 19 shots in 30 minutes. Joseph Woll was the star of the battle, however, making a couple huge saves, including a right foot save on Isac Lundestrom two minutes into the second. The Swedes had five previous power play goals this season, so the last they were going to do was let the Americans off scot-free. At 33:30, Vancouver Canucks prospect Elias Pettersson make it 1-0 after sniping a fast shot past Woll’s glove, using his extra room to his advantage. Sweden was simply outplaying the United States with the puck, despite the Americans taking more shots. New York Rangers forward Lias Andersson, who sat out against Slovakia on Tuesday, scored after an incredible passing play between him and Timothy Liljegren at 46:17, beating Woll’s blocker to make it 2-0. Woll was having a good game, but three goals on four shots prevented him from finishing in the crease. At 7:47 in the third, Oskar Steen unleashed a tremendous wrist shot, scoring shorthanded to make it 3-0. Then, 38 seconds later, Axel Jonsson Fjallby did a very similar move, using a defenceman as a screen before he sent a wrist shot over Woll’s glove to chase him from the net in favour of Jake Oettinger. The Americans still had time to get something on net, and Kieffer Bellows got them on board. With 12:24 done in the game, Bellows finally found a way to beat Filip Gustavsson on the power play, making it 4-1. With an empty net and just over three minutes to go, the American sscored again. Brady Tkachuk would get it after tipping it in with the extra man, forcing Sweden to play extra defensively. The goal did nothing to change the course of the game, however, resulting in Sweden taking the 4-2 victory and eliminating the Americans from gold contention. With the victory, Sweden will play the winner of Canada and the Czech Republic tomorrow night at 8:00 PM at the KeyBank Center. For the Americans, the team is looking for just their second medal in six tries at home, while Sweden is looking to win their first tournament since 2012 and their first in the United States, having finished second in 1989 and 1996. They also bring a perfect record to the finals, giving them momentum after years of misery.